The Bissell ProHeat 2x Select Upright Deep Carpet Cleaner, 9400M has a powerful 12 amp motor. It makes use of 12 rows of brushes which rotate to ensure deep cleaning. This cleaner also heats water so it can get rid of stains more effectively. Some models don’t do this, so this is a really nice features to have. This model promises edge-to-edge cleaning with its Powerful Surround Suction. Good suction will help a lot to get the extra water out of your carpets during the cleaning process. You can also customize the cleaner’s performance by choosing from Light Clean, Normal, Rinse, or Heavy Traffic settings. This allows you to conserve water/detergent when not needing full-out cleaning power. With its 30-foot power cord, moving it around the room is effortless. Long power cords really are nice, you won’t have to spend as much time unplugging and replugging. Read on to learn more about this machine and what it offers for cleaning your dirty carpets. 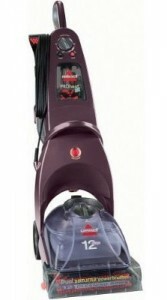 The Bissell ProHeat 2X Select Upright Deep Carpet Cleaner 9400M has garnered 299 customer reviews on Amazon.com. Reviews are quite mixed, with more customers giving positive feedback. Parts don’t seem to be built for long-term use – A number of customers have complained that the parts or even the machine itself is not as durable as they had hoped. Parts started to break within a year or sometimes just within months of use. Design flaws – Some reviewers felt that this model has some design flaws that need to be improved. Some claim that the rotating brush on the wand doesn’t move fast enough to be able to efficiently pick up dirt. Others also wished there was an indicator to let them know if the clean water on the tank was empty. Some users wanted a bigger tank to keep them from having to refill often. Leaking – Another major issue with unhappy customers is leaking. Some reviewers report that this machine can sometimes leave traces of dirty water as you clean. Cleans well – Most users agree that this cleaner does what it’s supposed to do when it comes to cleaning. Carpets indeed look better and smell fresher after a few runs. Great with stains – Customers also report that the double row of brushes, coupled with hot water, is great at removing stains in a relatively short time. Easy to use – Using this carpet cleaner is a cinch. It’s just like using your normal vacuum cleaner. Although reviews are mixed, it’s clear that there are no major complaints with this product when it comes to cleaning. It does a fairly good job of removing dirt and stains. Some customers have issues with the design (such as the small tank space and the occasional leaking), but most reviewers consider these as minor inconveniences that aren’t difficult to live with. As long as you have realistic expectations of the Bissell ProHeat 2x Select Upright Deep Carpet Cleaner 9400M, then you will probably be satisfied with this product too. I purchased this model one year ago. Today I rented a Rug Doctor! I bought one three year ago and have put in more money for repairs than what it would cost me to buy a new one. The spray jets, water pump, etc all have been repaired and replaced a couple of times. My daughter-in-law had the same problem with hers. I am not going to repair it again. I am buying another brand. I had the same problems as the other reviewers. Not buying Bissel products anymore. This cleaner should be recalled or stopped from being sold. Don’t buy!